The second-generation Samsung Galaxy Beam is one handset we were eager to get our hands on, but Samsung just went mum on the phone after it announced it at MWC. We’ve seen some retailers say they’d get it in June, but later the release date was pushed to July. And now finally, the second-gen Galaxy Beam with its 15-lumen built-in projector has arrived... East Asia. The Beam got in the limelight in Singapore as it gears up for official launch on July 7th, and the release is set for mid-July in Taiwan. The unique handset with a built-in projector features a 4-inch WVGA screen, a 1GHz dual-core processor and a 5-megapixel rear auto-focus camera. 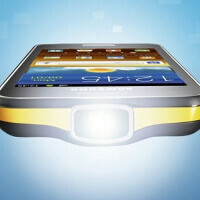 The Samsung Galaxy Beam prices vary from around $513 in Singapore to $566 off contract in Taiwan. Now, let’s just hope that the Beam makes the journey to the West sooner rather than later. Along with it, the Galaxy Ace 2 which is already on sale in a couple of markets is coming to East Asia for the less painful $350 off contract. One thing we don't yet know about the two handsets, though, is whether they'd launch with ICS or Gingerbread. We'll update you as soon as we get more info from Samsung. I'm not convinced. Wouldn't notifications, incoming calls etc disrupt the use of such a device while it's projecting? They'd interrupt if you want them to interrupt - you can always put your phone in airplane mode if you don't want to be disturbed. I've been in many meetings where Skype, other IMs e-mail popups interrupt the flow of the presentations. All I'm saying is that if people can't log out of their IMs there's no way they're putting their phone into airplane mode. Additionally, wouldn't that kind of defeat the purpose of the device a bit? True, the LG eXpo probably left a bad aftertaste for everyone who got it. Fitting the projector in a relatively thin - at least not too thick - body, though, is a whole different story. If this gets the traction it needs, it can easily change the phone landscape so that the projector becomes a standard feature of smartphones just like the cameras. And that's a huge prospect. A swivel projector could be very useful. Perhaps to display a keyboard, or video content. Projector phone like spice and micromax. Samsung also thing like that only. Cheap is cheap only. Samsung losing its image more. Yeah! Looking forward to galaxy ace 2!